Yule is quickly approaching! It will come and go in the blink of an eye, as do all of the holidays. But while it is here, we should make the most of all it has to offer us! It is one of my favorite times of the year, for sure. I take the preceding days of darkness and deep reflection quite seriously. And acknowledging the return of the Sun, along with the shift it will cause to my inner-growth, is welcome at this point. Quite welcome. If you are new to the Craft and looking for ways to celebrate Yule, this list will be pretty helpful for you. Even the more experienced Witch may learn a bit by reading on. After all, we never stop learning from each other. And learning from each other is indeed one of the purposes of this earthly journey we are on. Make your own Yule tree. This is a deeply gratifying experience. I am not going to go into great detail on it here, as I have written another post about it already. If you want to know more about this Yule based activity (and trust me you do 😉) than you can check out that post here. I will take the time to say that while you can certainly bring an evergreen tree in from the outdoors to decorate for Yule, it is somewhat more gratifying to build your own. And much more environmentally friendly. Take a Nature walk and gather gifts from Mama Nature to decorate your home for the holiday. 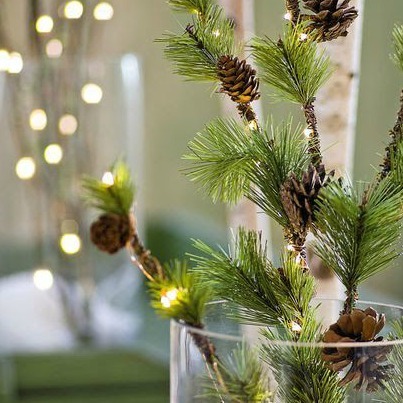 Pine cones, berries, ivy, holly, and pine boughs are all great choices. Greens are my personal favorites, as they remind me of the fact that life still abounds even in the dark, cold, quiet of winter. Go ahead and adorn your mantles, your doors, your thresholds, and whatever else pleases you with the treasures you find on your walk. And please do remember to add a few lights to the mix. They are a glimmering reminder that the Sun is about to bless us with a bit more of her life-sustaining power as each day passes. Light a Solstice fire. Sit and watch it burn as you place your intentions for the upcoming season. Quietly reflect on the inner-work you have completed throughout the previous season, and the ways that work has changed your perspective and enriched your life. Be sure to save some of the ashes from this holiday fire to make black salt, to use in your magical practice throughout the rest of the year. And please rest easy if you do not have a place to set a few logs ablaze. There is always an alternative way to practice magic. Always. Simply place a log on your altar and burn a candle on or near it. Whichever you are able to do, while taking safety into consideration. If you are city bound and cannot obtain a log, draw or print yourself a picture of one that pleases you. Done. And extra kudos for inventiveness too, Witches! Make a Yule log cake. There are recipes all over the web. One year I will make one and share the recipe with you. BUT for now you may have to do a bit of research for yourself. It won’t be hard. Trust me. Create a few orange pomanders as a symbol of reverence for the return of our oh-so-faithful friend, Mr. Sun. They are the perfect color for the task of representing Him in all of His glory. 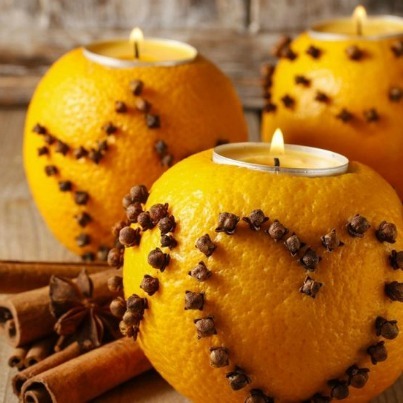 And it really doesn’t get much easier than adorning a few oranges with cloves now does it? This, by the way, is one of my very favorite Yule activities. Just sayin’! Snag yourself one quiet evening and spend it by candlelight. Of course it is nicest to engage in this activity on the evening of Yule. But any evening around the holiday will work. Just do what you have to do to make it happen Witches. You really don’t want to miss out on this activity. It is both indulgent and enlightening! I like to turn out all of the lights in my home, apart from any holiday lights I have put up. And then light at least one candle in each room. Please be mindful if you do this. You will not be attending every candle. Make certain they are placed where they will not present a fire hazard. Then take some time to sit quietly and reflect on the season, your growth, your goals, and anything else you feel drawn to contemplate. It can be a very empowering practice. AND you can give it a little extra boost of power by keeping the candle in the room you set aside for reflection out until after you have ‘meditated’. Then light it as a symbolization of the return of illumination not only to the world but to your personal space in it. Make salt dough ornaments to place on your tree. Or to use anywhere in your home for decoration. Maybe as part of a wreath, hanging from ribbons over a mirror, or adorning your altar space. These little beauties are simple, inexpensive and, most importantly, fun to make. You can do it by yourself or with your friends. If there are children in your life this is an amazing way to engage them in the celebration of Yule. They love it! You can make them in any shape that holds significance for you. I like to work with shapes which represent the holiday. Think; pine cones, suns, holly leaves, trees, candles, wreaths, and bells. Bake some sun bread. You can look up a recipe specifically for sun bread if you like. But it isn’t really necessary. Simply make your favorite bread recipe and form it into the shape of a sun, a ring, or even a simple circle. In my home we sit and engage in the practice of breaking bread together with our sun loaf. This is done by one person tearing a large piece of the loaf with their hands. Taking a nice little chunk of it and placing it in an offering dish for the Sun God, and then ripping another snack sized piece for themselves. They then pass the loaf to the next family member who also removes a small snack sized piece. The bread is passed until all family members have a piece to eat. Then all enjoy their piece together. It’s a lovely tradition. Give it a try! Make a pine cone bird feeder. This is another great activity to engage in with children. And it is so easy that even the little littles can participate. Just collect the biggest pine cones you can find. Attach a string to them for hanging. It’s best to do this first as it can be quite messy once the feeders are complete. Slather the cone with a light to medium layer of peanut butter and roll it in some bird seed. If you’re working with children don’t end the activity there. Be sure to take them outside to hang their handiwork up for the birds to enjoy. You will likely find that this is their favorite part. And if you have no littles to ‘help’ you make this sought after treat for our feathered friends, go ahead and make them by yourself. The birds won’t mind a bit! I promise! So, there you go Witches! That is a complete list of my current top 10 Yule activities. I hope you found one or two, or maybe even ten, that you would like to add to your own list.